I am relieved that all of this isn't new anymore. I remember when I only had Clark and every bad day hit me like a wave. I worried so much about doing things "right" that day or week or month, because I thought, back then, that doing things "right" meant that I could be one of those "good moms". Every teensy decision was fact-checked, worried over, and eventually swallowed. Part of this was due to insecurity over my young age (23), and part of it was just new-mom jitters. Someone out there knew if I was doing a "good" job, I was sure of it, and the answer was probably tucked into the pediatrician's file folder. Now that I have parented through a few stages I can say with total certainty that whether or not I am intentionally striving for balance, balance will always find me. The days my kids eat all organic and play hard and sleep hard and use their brains and grow and shine (good mom!) will be balanced out, whether I like it or not, by plenty of processed junk and television and tantrums (bad mom!). And the housework! There are stretches where I somehow swoop in and keep my house perfectly clean, each and every day, for weeks or months at a time. There are also days (weeks, months) where the thought of plugging in the vacuum cleaner or folding and putting away a single basket of clothes makes me want to throw something. The thing I try to tell myself, whether things are up or down: the bad days don't mean I'm bad and the good days don't mean I'm good. I'm just here, loving my kids as hard as I can and giving this crazy mom-ing thing my all. On the days it is easy AND on the days it makes me want to throw things. Things will get easier and things will get harder. My job is to do my best. The other morning I tried to nap with my kids. "Let mommy close her eyes for just ten minutes," I begged. I turned on cartoons and tucked them in next to me with sippy cups and shut my eyes. Fifteen minutes later I woke up (I had been sleeping so hard I was dreaming) to find the kids cracking eggs in my bed. Go ahead and read that sentence again. THEY HAD A CARTON OF EGGS. IN MY BED. THEY WERE CRACKING THEM OPEN. IN MY BED. My brain went blank with frustration. Cue the wanting to throw things feeling. I couldn't help wondering how other moms would handle a situation like that? But I had to shrug the question away and just do what I thought was right. No one can prepare you for this stuff. No one has the same kids, husband, life, personality, etc. etc. No one can do this for me, tell me how to do it, or grade me. So I just did what I thought was right. These (crazy wonderful smart persistent) little people of mine aren't good or bad either. They are little people. We work through a lot of human nature mixed with some patience and some impatience and good choices and bad choices and loads of amazing breathtaking personality. There are some things that work for us and some things that don't, and it takes a whole lot of needle-in-a-haystack-gut-trusting-straw-grabbing experimentation to separate the two. I do not feel ready to have this third baby. I am standing right on the edge and shaking my head, laughing at the idea of jumping off. I keep thinking, if only I had six more months, but I do not have six more months. I am 38 weeks pregnant. I may not have six more days. I think I am writing this post so I can read it next month when life is crazy and my house is not as clean as it is right now and feel reassured. And maybe (hopefully) it can reassure some of you too. cracking eggs on your bed. oh, erin. i can honestly say that i haven't had that one. but, i've had plenty of other moments that i have that brief thought of, "what on earth would other mothers do?!?" and then, i just do what i can at that moment. this mothering thing is so beautiful and so very hard. i know you don't see it all the time, but you do it so gracefully. trusting that everything will work out is so hard. i have a hard time when i can't be in control...which really? is always. I am never REALLY in control, I just think I am. You? you will be great. Because you already are! You hit the nail on the head with this one. I should bookmark it, so I can come back to it when I'm freaking out over having two. And, eggs on your bed? Wow! That's quite a thing to wake up to. You capture everything here so beautifully. I know I will come back to read this on many of my bad mom days. I am very much the same as you when it comes to the cyclical cleaning. I will have a few good weeks in a row and sit and wonder why I don't just do this all the time. Then one of the bad weeks hits, and energy is low, and it all falls apart so quickly, leaving me to wonder how I was ever on top of it to begin with. Whatever position I'm in, Good or Bad, it always feels so permanent. When it's good, I don't have to worry! Clearly I've figured it out and it won't ever be bad again. When it's bad, oh there's just no use in trying to be good, it will always be bad. I'm sending all the moms I know to this post, because it truly is perfection. I'll be thinking of you in the coming weeks! I bet you're just as ready as you are ever going to be. Hugs. I read this to my husband. I loved it. I know how you feel. I feel that almost every day. It is really a trial-and-error, learn on the job type of thing. It is never over and you are never sure you did the right thing. Hugs to you and all your egg-breakers! Oh, sweet Erin. I am sorry but I am laughing about the eggs. They are so creative! I swear my kids wouldn't even come up with the idea. And you are so right about this. all of it. And you'll be ready for this number 3 baby. Yes, it's crazy. But there's even more love. And this time around, you know what you're doing and it frees up all your energy for just loving on that little snuggler. xoxo wishing for a beautiful birth for you, friend. "The thing I try to tell myself, whether things are up or down: the bad days don't mean I'm bad and the good days don't mean I'm good." Lordhavemercy, eggs in the bed is one i've not heard before! You are totally, totally right about all of this. It may be your best post yet. And three kids is going to be quite a ride. I just try to keep thinking about those (crazy wonderful smart persistent) little people who are making me lose my mind some days and how they are going to be the most wonderful adults I'll ever get to be friends with. oh erin- I laughed about the eggs? I mean, I would have flipped, I think, if that happened to me. But oh my goodness how random and what were they thinking?! But you're so right about it all. And they're great thoughts for me to have in my head too- so thanks for sharing. I can't believe your so close to having this baby!! we can all relate, does that make it any better? : ) hang in there...i just love this post! Waking up to that egg scene must have been so surreal! Kind of like me discovering today that my son poured glass cleaner on my $200 digital picture frame and ruined it. I had a "bad" day today and really needed this. It was a gift. Thank you. I absolutely ADORE that third paragraph. It's quite possibly my new motto. No lie. I'm going to print it out and put it on my fridge with you as the author. Seriously. And the eggs? may have sent me over the edge. Thank you so much for this post. I was nodding along with you and when I got to the egg part, I started laughing so hard my husband came running into the room to see what had me so hysterical. It's good to remember that our days whether good or bad don't define us. I'm coming late to this, but as it turns out, I'm also right on time. "the bad days don't mean I'm bad and the good days don't mean I'm good" is exactly what I needed somebody to say to me today. It's funny how I get hung up on one or the other so often. Thank you for the perspective on both! The cracking-the-eggs part made me want to laugh and cry at the same time. All moms have moments like that (I know I most certainly do). Thanks for the reminder that we're not "good" or "bad." We're just striving, doing our best...in this adventure called Life. 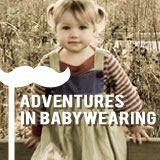 I just found your blog today through Adevntures in Babywearing's twitter and Im so glad I read this post. Thank you so much for sharing this...I really needed to hear it today. Congratulations on the beautiful addition to your family!